This is where the jumping all began! At the base of the Aconcagua, the only 7,000m peak outside Asia situated some 100kms from Mendoza, in September 2009. 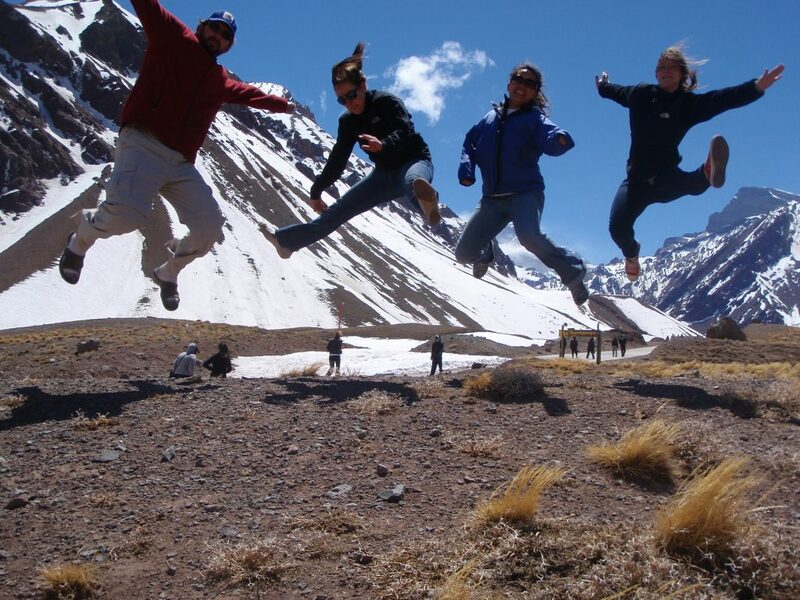 I was back-packing round South American and was was on a day tour into the Andes when I met Meghan and her friends. They were on a long-weekend break from their semester in Chile and after seeing them jump, I asked if I could join. This is that picture! From there, it just developed without any planning or much thinking. There were a few more on the travels round South and Central America, the odd one here-and-there whilst living back in the Cayman Islands before I started doing it far more frequently on my travels round the world. These travels started back home in South Africa for the 2010 football world cup and ended some two years later at the Olympics here in London. In-between, I spent a few months in largely Eastern and Central Europe, just under a year exploring South and South-East Asia (including being in India and Bangladesh for the 2011 cricket world cup), a few fantastic months in the Middle East, a month in Indonesia, three months in New Zealand 9for the 2011 rugby world cup). In late 2012 I moved to London and over the past four-and-a-bit years, the jumping has continued on various travels and adventures across Europe, Africa, both South and North America and Australia! People often ask who takes the pictures and that’s either people who are traveling with me or complete strangers. I find friends initially think it quite a nuisance; is there rally a need to jump again, Jazza?, before they often start to enjoy it. I certainly owe a huge debt of gratitude to all the photographers out there who make this all possible. So what’s this site about then? Quite simply, I’m a travel and sports-fanatic who enjoys sharing his stories and hopes it encourages you to explore this wonderful world of ours. I love chatting travel so if you have any questions, please give me a shout @ this link. ps – *UPDATE* September 2017 … I’ve decided to take some time off work and will be heading back on the road full-time, travelling from Ethiopia to South Africa over 6-9 months. Look out for a whole heaps of new jumps round Africa! Love your work mate! I’m finally here, going to read it beginning to end, cheers for sharing!